Perimeter Control Technology - Lightweight, high strength, X Brace design unfolds instantly to create the most versatile perimeter management system. Features include: Easy Carry Handle, Non Slip Feet, Quick, Close Connect Strap, Nestability, Reflective and High Visibility Colors - Safety Green or Safety Orange.. Ideal for rapid closure of roads by Emergency Responders. Stores in a collapsed state measuring 48" x 6" x 8", Fits in personal responders vehicles, fits in a compartment of a fire truck, ambulance, police car, highway department truck. No longer do you need to wait until the highway department shows up to close the road. Signs and Storage bag sold separately. Note - Picture shows 2 units. Click on the link for more detailed information and pictures. 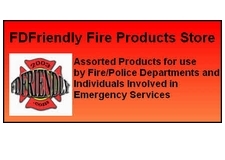 AS of January 2013 the Flex Safe barricade is also available in Safety Orange.